The Simien Mountains are one of Ethiopia’s most stunning destinations. With its diverse flora and fauna, immense views and extraordinary geography, it’s an exceptional place that can be enjoyed by hardy trekkers and afternoon strollers alike. A couple of nights at the beautiful Limalimo Lodge at either end transforms this 3 day trip into a unforgettable 5 day experience. Spot some of Ethiopia’s endemic and most charismatic wildlife, including the Gelada Monkeys, the Ethiopian Wolf and Walia Ibex. All camping equipment can be provided. If time end your tour relaxing in the unforgettable Limalimo Lodge. Upon arrival in Addis Ababa, transfer to Gondar where your guide will meet you at the airport. Spend the day exploring this historic town. Your first stop will be Debre Berhan Selassie Church, whose heavy and unassuming stone facade hides the colourful frescoes inside. After this you will head to the well-preserved Fasil Gebbi in Gondar, described by some as the ‘Camelot of Africa’ for a guided tour. Now known as the Royal Enclosure, this was initially founded in 1636 and built by Emperor Fasilides as his home, but successive emperors and rulers added to his blueprint. Now, the buildings span over 70,000 square metres of land and include palaces, libraries, two lion houses, royal baths, and a women’s vocational school built by Mentewab, the Empress of Ethiopia. Within the enclosure there there are multiple architectural styles and influences jostling for position. The influences include Indian, Portuguese, Moorish and Aksumite. 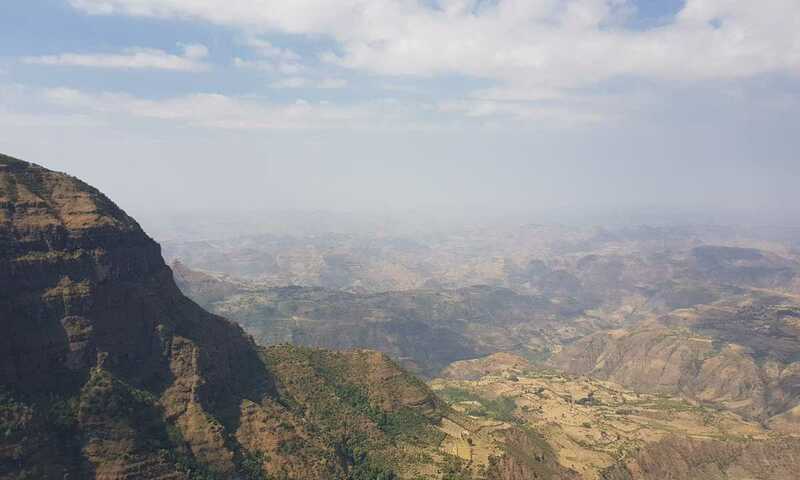 Drive from Gondar to Debark, the headquarters of the Simien Mountains National Park. The first day of proper hiking starts with breakfast before you head out to the trail along the ridge. There’s a wonderful vantage point, offering incredible views over the foothills ~800 metres below. The mountains are known worldwide for their biodiversity and your guide will point out all point out flora and fauna of note. Along the trail, Gelada Baboons, Klipspringer and Walia Ibex make regular appearances and birds soar on the thermals beneath you as you look out over the views. The highlight of today’s trek is Genbar Falls, a waterfall over a sobering 500m sheer drop, which you’ll see from opposite. These plummet into Geech Abyss - a vast canyon cut into the main wall of the escarpment. After a break for lunch, you’ll carry on towards Geech, a remote traditional village with thatched roofs. Geech camp is a great spot to watch the sun go down over the range and you’ll often see troops of Gelada baboons climbing down the precipitous slopes to their sleeping quarters in caves in cliffs below. Today you’ll head to Imet Gogo, a headland at the edge of the ridge that stands close to 4000 metres altitude with unbelievable 360 degree views of the surrounding mountains. You can see west, back towards Sankaber and Geech, and south east along a large Gorge towards tomorrow’s destination, Inyate. Trail through Giant Erica woodlands before before emerging on the moorland top at Inatye, the second highest peak in the western part of the park. Drop down to Chenek camp along a path that has some impressive views of the lowlands below. Overnight at Chenek camp which is the best spot to see both Ethiopian wolves and Walia Ibex. Mount Buahit is Ethiopia’s third highest peak, standing at an impressive 4430 metre. Your route to Mount Buahit follows footpaths off the road alongside a stream that trickles down the hill. This is quite a steep walk, but you can take regular breaks at great view points en route. This is your best chance to see Walia Ibex. No experience of the Simien Mountains is complete without a night at the stunning Limalimo Lodge. Spend the morning relaxing around the lodge and soaking up the last of the incredible views. After an early lunch, transfer to Gondar airport to catch a flight back to Addis. Your guide will meet you at the other side and take you for a farewell dinner before transferring back to Addis airport for your international flight home. Prices are per person for 4 pax. This trip can run as a group trip, with prices starting from $1,032 per person for a complete group. If you are looking to join a group or you are a solo traveller we will help to form likeminded groups of travellers. Please let us know your travel plans. 2 nights in hotels and 2 nights on trek. Breakfast included on all days except day of arrival. Full board at Limalimo Lodge. Transport via minibus and 4WD's. English speaking guides available in all locations. Entrance fees in Gondar and Simiens. Local flights based on using Ethiopian Airlines for international flights. Lunch and dinner in Gondar. Dinner in Addis on last night. Drinking water on Simien Trek. In effort to reduce harmful plastic waste we are requesting clients to use water filter system. Get in touch for more details. Any meals not stated as included.